Where Does Our Stuff Go? Who Does It Help? 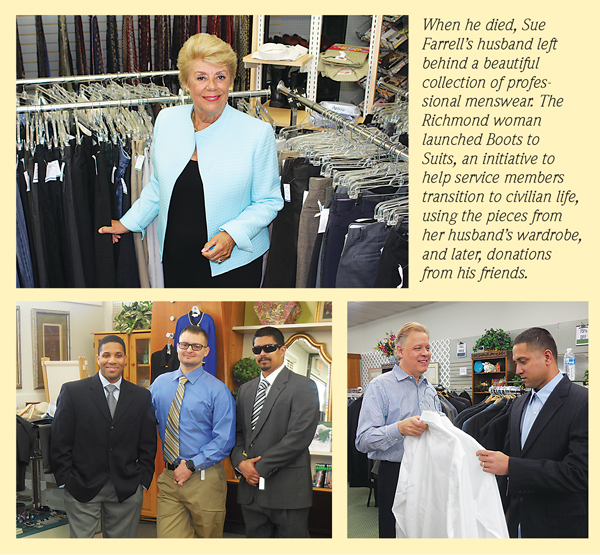 It took Sue Farrell a while after the death of her husband, Joe, in 2013 to feel like she could give his clothes away. It was important that his belongings go to someone or some place special. Finding the right organization to receive that kind of donation, and knowing where those items will end up, can take time and effort. Not all organizations have the same transparency. Farrell had read articles about how a government agency was helping service members move into civilian careers. 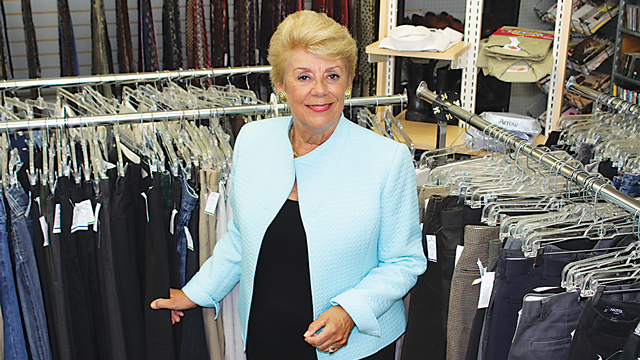 “There are over 800,000 veterans in the U.S. and many have mental or physical issues,” she says, noting that it was her goal to collect professional clothing to make the career transition easier for some of these veterans. A former member of the Junior League of Richmond, Farrell received the green light from the organization to launch a program for veterans entering the professional world. The original Boots to Suits inventory consisted of the custom tailored suits, ties, and casual clothing from her husband’s closet at home. Each item had its own memory attached to it. “It was emotional for me to give his clothes away,” Farrell says. So far the program has helped more than 225 veteran families get the clothing and accessories they need to pursue their careers. Here’s how it works: Veterans with a voucher issued by the Virginia Transition Assistance Program, part of the Virginia Department of Veterans Services, can make an appointment at either the Cary Street or Stratford Hills location of The Clothes Rack where Boots to Suits is housed, and the proper clothing and sizes will be pulled for them. Monies generated by sales at the stores go to meet the organization’s mission to improve the community. “Our focus is working with the East End community of Richmond,” Frye says, noting that the organization’s community outreach programs include Families First, Literacy Through Art Outreach, Good Sports, and Kids in the Kitchen. Boots to Suits and The Junior League of Richmond are just two of several options for people who want to donate their items to an organization with a mission. Kristi Smith, treasurer and chair of this year’s Cinderella Dreams Project for Midlothian Junior Women’s Club, is always on the lookout for the donation of prom dresses. This year, about 500 girls came to the retail space at Westchester Commons to hunt for a dress. “We need a lot of dresses,” Smith says, adding that donations of prom dresses are accepted year-round at any location of Puritan Cleaners. Currently, the organization is in need of dresses size eighteen and up. Once the annual Cinderella Dreams event is over, the volunteers from the group take some of the dresses not deemed prom-style and donates them to The Clothes Rack and Dress for Success, an organization that provides attire for women attempting to move into professional fields and in need of the proper clothing for interviews. “We work with them quite a bit,” Smith says. Eighty percent of the high school-aged teens who come to the shopping event are from families in financial need. “We have about 20 percent of kids who would probably still have a prom dress, but it’s nice to provide it, so they don’t have to worry about using discretionary money to buy a dress,” Smith says. When it comes to donating a variety of items – everything from clothing to household goods – Goodwill is one of the first organizations that comes to mind. 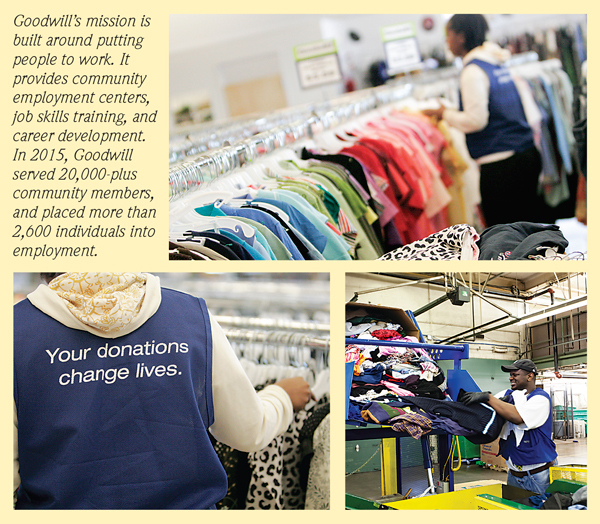 Seventy-five percent of items donated by families are sold in Goodwill stores. In the Richmond area, the organization has thirteen attended donation sites and sixteen stores, as well as unattended boxes at landfills where people can place donated items. Donations are not only a great bargain for shoppers, but they also serve a greater purpose. “Folks who donate to Goodwill know that somebody is getting a belonging that means something to someone else, and they know that they are donating to our mission,” Brackett says. 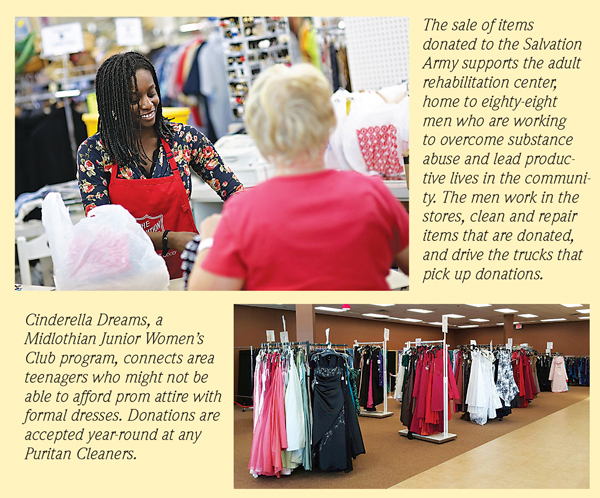 The Salvation Army Central Virginia is another trusted source for donations. All of the donations made to the organization are taken to the Salvation Army Adult Rehab Center Family Store at 2601 Hermitage Road. It is one of the organization’s three stores; the other two are located on Midlothian Turnpike and Mechanicsville Turnpike. The Salvation Army also has dropboxes, largely in Kroger parking lots, and will pick up items by scheduling a pickup through 1-800-SA-TRUCK (1-800-728-7825). The organization accepts a variety of donations, everything from clothing and shoes to furniture and appliances. “This is very much a business of selling items to an audience searching for those items,” says Matt Pochily, communications director, Salvation Army Central Virginia. The sale of these items support the adult rehabilitation center, home to eighty-eight men who are working to overcome substance abuse and lead productive lives in the community. The men work in the stores, clean and repair items that are donated, and drive the trucks that pick up donations. Funds generated through the stores go to support the Salvation Army’s mission of making a difference in the lives of the people it serves. Some organizations vying for your donations via parking lot drop boxes or mailers make it virtually impossible to find out where your donations end up. They could benefit a worthy cause or the items you donate may be sold or recycled for profit. Organizations that take in donations include Ohio Mills, www.helpvets.com and Green Drop, which has a location in Richmond, and says on its website that it converts lightly used clothing and household items into critical funds for great American charities. You’ll also find boxes for Planet Aid, which states on its website that it recycles and also sells clothing to domestic buyers or overseas customers. According to its website, a portion of that good-quality clothing goes to domestic thrift stores, but the large majority gets sold to overseas customers. Ultimately, if you’re emotionally invested in the items you are giving away, like Sue Farrell of Boots to Suits, or classify yourself as a conscientious consumer, you may want to do your research before donating to an organization that is unfamiliar to you. “Be sure and do your homework,” says Brackett of Goodwill. Previous articleScience in the Sky!